Garlic flavored, hot and spicy lasaniya batata is a delicious curry if your palate can tolerate the fiery taste of red chillies. 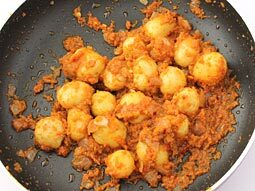 However, those who appreciate the spiciness and are ready to go to any length to enjoy the best flavor of garlic and potato sautéed in spices will experience the heavenly delight. One advice though; keep roasted peanuts, or fryums or something sweet and cold handy to soothe your palate immediately. 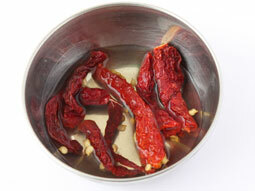 Soak dry red chillies in 2-tablespoons water for 10 minutes. 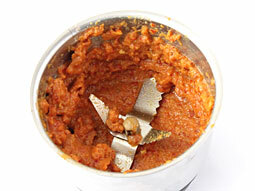 Grind garlic, ginger, soaked dry red chilli, tomato, coriander powder, cumin seeds, turmeric powder and salt together in a grinder and make a smooth tomato-garlic paste. Heat 1 tablespoon oil in a non-stick pan. 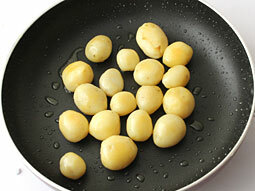 Shallow fry boiled potatoes for 2 minutes over medium flame. Sprinkle chaat masala and garam masala over it and fry for 1 more minute. Turn off flame and transfer potatoes in a bowl. Heat 4 tablespoons oil in the same pan. 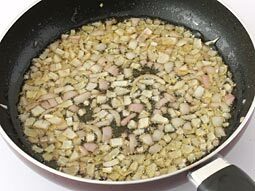 Add finely chopped onion and sauté until light brown. 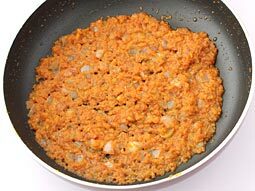 Add tomato-garlic paste and sauté on low flame until oil starts to separate or for approx. 4-5 minutes. Add dry red chilli powder and mix well. 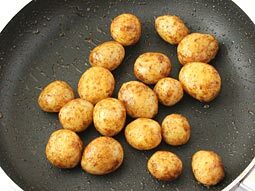 Add shallow fried potatoes, stir and cook for 3 minutes. Turn off flame and transfer prepared baby potatoes in a serving bowl. Lasaniya batata is ready. Garnish it with coriander leaves and serve hot. Adjust garlic and dry red chilli quantity according to your palate’s capacity to handle spiciness. However, we believe that it should be enjoyed for its spiciness and its hotness should not be reduced. 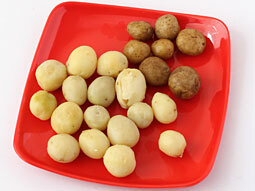 If you do not have baby potatoes, then take large normal potatoes, boil and cut them into small 1-inch cubes. Use Kashmiri red chillies to get nice red-hot color with less spiciness. 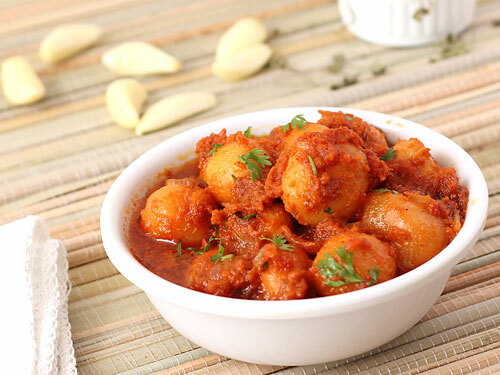 Use more oil (6 tablespoons) if you are not worried about consuming too much fat while enjoying lasaniya aloo. It really improves the taste and texture. 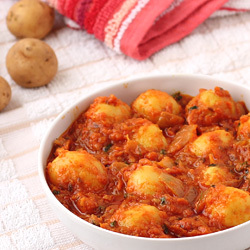 Serving Ideas: Lasaniya batata is generally served with roti or paratha as a full meal. However, to enjoy its full flavor and if your palate can tolerate the heat, then enjoy it on its own or with fryums (wafers) and roasted peanuts as snack. Your recipes are absolutely amazing Please keep up the good work. Very good recipes! very authentic dishes! Thank you. Good one. Delicious dish. User friendly website. Nice. Awesome recipe. Tried at home. It's easy to make. I am a teenager and I loved this recipe. Thanks. Brilliant recipe. Delicious. Spicy and hot. Superior. Number 1 of the Best website. Response: Thanks Mansi for trying the recipe and I am glad you liked it. Thanks for this delicious and versatile recipe. I've made this recipe so many times with many variations and it just doesn't fail!! Always an instant hit with everyone!! I've made it semi dry like a starter, made it like a gravy, added curd to the gravy, and even used the same gravy for a spicy egg curry!!! Love it!!!! It's really good. I think I will try tomorrow. Response: Find more Diwali Recipes at given link http://foodviva.com/diwali-recipes/ . very yummy............. this recipe just suits the kind of hot and spicy taste required in my home. I also liked the idea of having fryums and roasted peanuts along with it to tolerate the heat, it also improves the taste.